It’s starting to look like the Tour of California. Victorious in five stages out of eight there last month, Peter Sagan is showing a similar dominance in stages of the Tour de Suisse, and today clocked up his fourth victory in six days in the race. The Liquigas Cannondale rider powered past Sky Procycling rider Ben Swift close to the line in Bischofszell, with Orica-GreenEdge rider Allan Davis scooping third place. Also hoping for a strong finish is Movistar’s Rui Costa, who once again held on to the leader’s jersey and retained his eight second lead over Frank Schleck (RadioShack Nissan). Astana’s Roman Kreuziger is seven seconds further back in third place. The stage was a lumpy one, but lacked major climbs; the ascents on the 199 kilometre from Wittnau comprised three third category climbs and two fourth category ascents. It always looked like being a day for a break to battle towards the end, and so it proved. Approximately thirty kilometres after the start, Matteo Montaguti (AG2R La Mondiale), Troels Ronning Vinther (Saxo Bank), Baden Cooke (Orica-GreenEdge), Vicente Reynes (Lotto Belisol) and Swiss rider Rubens Bertogliati (Team Type 1-Sanofi) clipped away and clocked up a big advantage. Bertogliati’s presence was a threat, though, given that he started the day just one minute 45 seconds back, and with the bunch not willing to give him much space, he eventually agreed to return to the peloton and thus enable the others to build a bigger lead. The break topped out with an advantage of five minutes, retaining all bar one of that with forty kilometres remaining. Inevitably, the bunch ramped up the pace from there and drew closer and closer. The fourth category climb of Schocherswil put pressure on the break and only Montaguti and Vinther persisted afterwards. However they were reeled in two kilometres from the line, after which the sprinters’ team did their final work in trying to manoeuvre their riders into position. Sky’s train did what it could for Swift, but Sagan was lurking nearby and despite being blocked in slightly, had enough oomph to dart past the Briton for yet another win. Tomorrow’s 34 kilometre Gossau time trial will be a big test for Schleck, who traditionally is not that strong against the clock. Costa and Kreuziger will battle for the race lead, but with 17 riders less than a minute off the yellow jersey, things could be completely reshuffled. GBR 2 Ben Swift (Sky Procycling) s.t. AUS 3 Allan Davis (Orica - GreenEDGE) s.t. SUI 4 Michael Albasini (Orica - GreenEDGE) s.t. ESP 5 Oscar Gomez Freire (Katusha Team) s.t. FRA 6 Lloyd Mondory (Ag2R - La Mondiale) s.t. ITA 7 Marco Marcato (Vacansoleil - DCM Pro Cycling Team) s.t. ITA 8 Alessandro Bazzana (Team Type 1 - SANOFI) s.t. DEN 9 Matti Breschel (Rabobank Cycling Team) s.t. ITA 10 Francesco Gavazzi (Astana Pro Team) s.t. BEL 12 Greg Van Avermaet (BMC Racing Team) s.t. NED 13 Steven Kruijswijk (Rabobank Cycling Team) s.t. DEN 14 Jakob Fuglsang (RadioShack - Nissan) s.t. NED 15 Wout Poels (Vacansoleil - DCM Pro Cycling Team) s.t. SUI 16 Mathias Frank (BMC Racing Team) s.t. LUX 17 Frank Schleck (RadioShack - Nissan) s.t. POR 18 Rui Alberto Faria Da Costa (Movistar Team) s.t. NED 19 Robert Gesink (Rabobank Cycling Team) s.t. USA 20 Alex Howes (Garmin - Barracuda) s.t. ESP 21 Gorka Izagirre Insausti (Euskaltel - Euskadi) s.t. ITA 22 Giampaolo Caruso (Katusha Team) s.t. AUT 23 Georg Preidler (Team Type 1 - SANOFI) s.t. ITA 24 Daniele Colli (Team Type 1 - SANOFI) s.t. GER 25 Fabian Wegmann (Garmin - Barracuda) s.t. CZE 26 Roman Kreuziger (Astana Pro Team) s.t. FRA 27 Julien El Fares (Team Type 1 - SANOFI) s.t. ESP 28 Mikel Nieve Ituralde (Euskaltel - Euskadi) s.t. RUS 29 Vladimir Gusev (Katusha Team) s.t. CRO 30 Robert Kiserlovski (Astana Pro Team) s.t. IRL 31 Nicolas Roche (Ag2R - La Mondiale) s.t. ITA 32 Damiano Cunego (Lampre - ISD) s.t. ESP 33 Jose Joaquin Rojas Gil (Movistar Team) s.t. GER 34 Marcus Burghardt (BMC Racing Team) s.t. FRA 35 Steve Chainel (Equipe Cycliste FDJ - BigMat) s.t. SWE 36 Thomas Löfkvist (Sky Procycling) s.t. NED 37 Johnny Hoogerland (Vacansoleil - DCM Pro Cycling Team) s.t. ESP 38 Alejandro Valverde Belmonte (Movistar Team) s.t. CAN 39 Michael Barry (Sky Procycling) s.t. BEL 40 Maxime Monfort (RadioShack - Nissan) s.t. DEN 41 Chris Anker Sorensen (Team Saxo Bank) s.t. FRA 42 John Gadret (Ag2R - La Mondiale) s.t. USA 43 Thomas Danielson (Garmin - Barracuda) s.t. BEL 44 Bart De Clercq (Lotto - Belisol Team) s.t. ITA 45 Alessandro Petacchi (Lampre - ISD) s.t. FRA 47 Thibaut Pinot (Equipe Cycliste FDJ - BigMat) s.t. SUI 48 Martin Elmiger (Ag2R - La Mondiale) s.t. SUI 49 Rubens Bertogliati (Team Type 1 - SANOFI) s.t. FRA 50 Anthony Geslin (Equipe Cycliste FDJ - BigMat) s.t. GER 51 Linus Gerdemann (RadioShack - Nissan) s.t. NED 52 Laurens Ten Dam (Rabobank Cycling Team) s.t. USA 53 Levi Leipheimer (Omega Pharma - Quickstep) s.t. ITA 54 Dario Cataldo (Omega Pharma - Quickstep) s.t. USA 55 Thomas Peterson (Garmin - Barracuda) s.t. EST 56 Tanel Kangert (Astana Pro Team) s.t. NED 57 Tom Jelte Slagter (Rabobank Cycling Team) s.t. KAZ 59 Dmitriy Muravyev (Astana Pro Team) s.t. ESP 60 Ruben Perez Moreno (Euskaltel - Euskadi) s.t. ITA 61 Salvatore Puccio (Sky Procycling) s.t. NED 62 Niki Terpstra (Omega Pharma - Quickstep) s.t. UKR 63 Volodymyr Gustov (Team Saxo Bank) s.t. SUI 64 Martin Kohler (BMC Racing Team) s.t. NED 65 Karsten Kroon (Team Saxo Bank) s.t. GBR 66 Luke Rowe (Sky Procycling) s.t. GER 67 Danilo Hondo (Lampre - ISD) s.t. BEL 68 Tom Boonen (Omega Pharma - Quickstep) s.t. ESP 71 Javier Mejias Leal (Team Type 1 - SANOFI) s.t. BEL 73 Gert Steegmans (Omega Pharma - Quickstep) s.t. BEL 74 Nick Nuyens (Team Saxo Bank) s.t. FRA 75 Jérémy Roy (Equipe Cycliste FDJ - BigMat) s.t. BEL 76 Maarten Wynants (Rabobank Cycling Team) s.t. GER 77 Andréas Klöden (RadioShack - Nissan) s.t. LUX 78 Laurent Didier (RadioShack - Nissan) s.t. RUS 79 Vladimir Karpets (Movistar Team) s.t. NED 80 Bauke Mollema (Rabobank Cycling Team) s.t. FRA 81 Remi Cusin (Team Type 1 - SANOFI) s.t. GBR 84 Steven Cummings (BMC Racing Team) s.t. ESP 86 Vicente Reynes Mimo (Lotto - Belisol Team) s.t. AUS 89 Mathew Hayman (Sky Procycling) s.t. BEL 93 Kris Boeckmans (Vacansoleil - DCM Pro Cycling Team) s.t. DEN 98 Martin Mortensen (Vacansoleil - DCM Pro Cycling Team) s.t. SUI 99 Fabian Cancellara (RadioShack - Nissan) s.t. AUS 100 Stuart O' Grady (Orica - GreenEDGE) s.t. GER 101 Grischa Niermann (Rabobank Cycling Team) s.t. USA 102 Tyler Farrar (Garmin - Barracuda) s.t. BEL 103 Johan Vansummeren (Garmin - Barracuda) s.t. RUS 104 Alexander Efimkin (Team Type 1 - SANOFI) s.t. USA 105 Edward King (Liquigas - Cannondale) s.t. RUS 106 Vladimir Isaychev (Katusha Team) s.t. ESP 107 José Ivan Gutierrez Palacios (Movistar Team) s.t. FRA 108 William Bonnet (Equipe Cycliste FDJ - BigMat) s.t. FRA 109 Sébastien Minard (Ag2R - La Mondiale) s.t. ITA 110 Stefano Agostini (Liquigas - Cannondale) s.t. 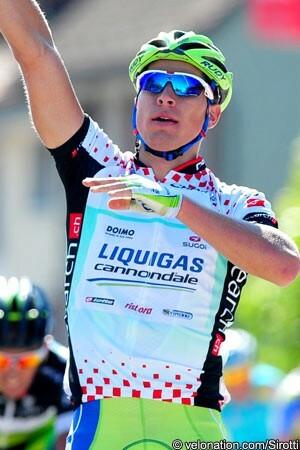 ITA 111 Tiziano Dall'antonia (Liquigas - Cannondale) s.t. ITA 112 Marzio Bruseghin (Movistar Team) s.t. ITA 113 Matteo Trentin (Omega Pharma - Quickstep) s.t. POR 114 Sergio Miguel Moreira Paulinho (Team Saxo Bank) s.t. FRA 115 Guillaume Bonnafond (Ag2R - La Mondiale) s.t. ESP 116 Igor Anton Hernandez (Euskaltel - Euskadi) s.t. ESP 117 Xabier Zandio Echaide (Sky Procycling) s.t. ITA 118 Daniel Oss (Liquigas - Cannondale) s.t. SVK 119 Peter Velits (Omega Pharma - Quickstep) s.t. NED 120 Thomas Dekker (Garmin - Barracuda) s.t. FRA 121 Romain Sicard (Euskaltel - Euskadi) s.t. ITA 122 Jacopo Guarnieri (Astana Pro Team) s.t. NOR 123 Lars Petter Nordhaug (Sky Procycling) s.t. ESP 124 Joan Horrach Rippoll (Katusha Team) s.t. USA 125 Brent Bookwalter (BMC Racing Team) s.t. USA 126 Timothy Duggan (Liquigas - Cannondale) s.t. KAZ 127 Assan Bazayev (Astana Pro Team) s.t. ITA 128 Luca Paolini (Katusha Team) s.t. IRI 131 Mehdi Sohrabi (Lotto - Belisol Team) s.t. SUI 132 Raimond Künzli (Spidertech Powered By C10) s.t. FRA 133 Cédric Pineau (Equipe Cycliste FDJ - BigMat) s.t. CAN 135 David Boily (Spidertech Powered By C10) s.t. BEL 136 Klaas Lodewyck (BMC Racing Team) s.t. USA 137 Caleb Fairly (Spidertech Powered By C10) s.t. BEL 138 Frederique Robert (Lotto - Belisol Team) s.t. USA 139 Lucas Euser (Spidertech Powered By C10) s.t. DEN 140 Michael Morkov (Team Saxo Bank) s.t. CAN 141 Ryan Anderson (Spidertech Powered By C10) s.t. DEN 142 Brian Vandborg (Spidertech Powered By C10) s.t. AUS 143 Cameron Meyer (Orica - GreenEDGE) s.t. CAN 144 Guillaume Boivin (Spidertech Powered By C10) s.t. ITA 146 Leonardo Bertagnolli (Lampre - ISD) s.t. ESP 147 Jesús Lopez Herrada (Movistar Team) s.t. LTU 148 Ignatas Konovalovas (Movistar Team) s.t. SWE 6 Thomas Löfkvist (Sky Procycling) s.t. NED 29 Tom Jelte Slagter (Rabobank Cycling Team) s.t. ITA 31 Salvatore Puccio (Sky Procycling) s.t. NED 36 Laurens Ten Dam (Rabobank Cycling Team) s.t. ESP 67 Rafael Valls Ferri (Vacansoleil - DCM Pro Cycling Team) s.t. NED 99 Niki Terpstra (Omega Pharma - Quickstep) s.t. ITA 119 Stefano Agostini (Liquigas - Cannondale) s.t.